The Los Angeles Public Library has a collection of photos where you can immerse yourself in Los Angeles history. I've spent many hours looking at pictures of Bunker Hill. The collection creates an odd juxtaposition of dilapidated houses slated for destruction, which to my eyes look like treasures, with horn-rim-spectacled men in suits hovering over models of the sanitized landscapes the Community Redevelopment Association imagined would replace the slums. The library's collection includes a similar juxtaposition through photos of Chavez Ravine, the neighborhood near Elysian Park that was buried under Dodger Stadium. Search for "Chavez Ravine" in the collection and you will see a woman, Aurora Vargas, being dragged away from her home by four policemen. A little girl (her daughter? sister? niece?) stands behind her, crying. Their family was the last remaining after the city started evicting homeowners there in the early 1950s. The city claimed that the neighborhood would be redeveloped into affordable housing, but then they pretty much gave the land away to Dodgers owner Walter O'Malley. Another photo is captioned "Draftsmen through, bring on the shovels." In yet another, a man who looks like a well-fed character actor in a Coen Brothers movie holds up a shovel marked with the date September 17, 1959. Urban redevelopment did not just affect communities of color. My mother grew up in a house in a white, middle class subdivision in San Bernardino that was claimed by eminent domain and torn down for a freeway expansion many years ago. But the effects that dispossession justified by racism and classism had on our built environments should be clear. This legacy might come to mind when people see bike lanes in neighborhoods impacted by redevelopment, neighborhoods that either suffered the ill effects of things like highways and demolitions, or were considered so undesirable that they were simply ignored by cities for decades. Maybe the bike lane markings seem to trace a thread of power, connecting wealthier, whiter communities with the city's development agenda, and threatening communities of color with displacement yet again. I want to empower communities to embrace bicycling as a healthy form of transportation that re-connects us with our environments. I'm not very interested in advocating for bike infrastructure that increases property values for developers benefiting from public subsidies. I think urban redevelopment was a huge mistake, not something we should resurrect under the guise of terms like "green," "transit-oriented development," "walkability," and "bike friendly." The bicycle is much more than a toy of privileged people. However, working as we do in landscapes shaped by long histories of segregation and racism, that is a characterization that bike advocates encounter. Historical collections like this one at LAPL offer us a way to understand how, for so long, we've operated in the same cities, the same spaces, with such different ideas about what should be happening in them. This is a crucial step in building equitable future cities. Cultural anthropology, in the cyborgian, science-and-technology-studies, Deleuze&Guattari lovin' vein, is pretty okay with branching, tangential connections that turn out to be heavy with meaning. 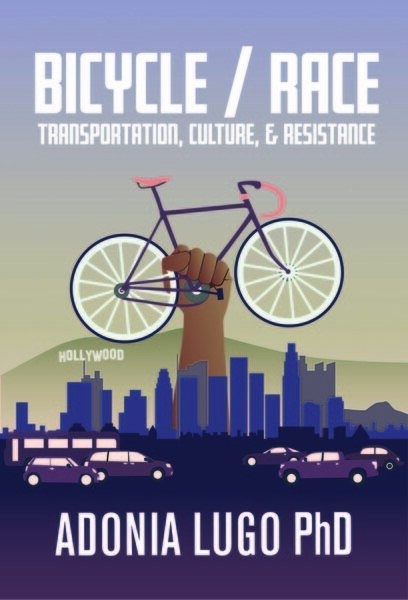 So sometimes, in the throes of a dissertation panic attack, I can spend a few days reveling in some fleeting obsession with a topic that does not seem to relate, directly, to bikes, bodies, and public space in LA. Most recently, this topic has been rock groupies, specifically Pamela Des Barres and her merry band of GTO's. Southern California in the late 1960s has been a longstanding "if I could time travel" destination of mine, and Miss Pamela's memoir I'm With the Band takes me there like whoa. And, besides the locale of Los Angeles, there is a slight connection to my research because...they drive everywhere? Who am I kidding, it's just a fascinating time period to read about. Now that I've satisfied my modesty by burying the lede, here's a link to a talk I gave in March for Portland State University's Transportation Seminar Series. It's called "Bikes, Bodies, and Public Space: The Role of Human Infrastructure in Urban Transport," and you can watch a video of the talk (warning: I showed a stop motion video that has a lot of flashing images). After the talk, I had lunch with a group of Masters in Urban Planning (MURP) students who are researching gentrification tensions in North Portland. Bike infrastructure projects in North Portland have contributed to ongoing concerns about city investment and private development driving up costs in that part of town, historically the heart of Portland's black community. East Portland is now the most diverse part of the city, with many families continuing to leave North Portland due to gentrification. Debora Leopold Hutchins, chair of the North Williams Traffic Operations and Safety Project Stakeholder Advisory Committee, Ellen Vanderslice, project manager at the Portland Bureau of Transportation, and Alison Graves, the executive director of the Community Cycling Center, were also there. We had a funny moment when Debora thought the UR in MURP stood for "urban renewal," and the MURP students emphatically denounced the mid 20th century trend of bulldozing neighborhoods and replacing them with stadiums, highways, and housing towers. I love talking to critical urban planners! I recently started a research project where I'll be interviewing leaders in Seattle's communities of color about bicycling. My hunch is that I am going to hear a lot about recreational cycling because there are popular paths and routes that carry roadies through South Seattle, and with public safety concerns in the area there aren't a lot of people choosing to bike commute there. I think I am going to hear people talk about transit and pedestrian justice while condemning bicyclists as elitist outsiders. Bicycling can feel scary and dangerous. Some motorists treat us like we shouldn't be using public streets, honking, menacing, throwing objects. Bike advocates promote bike infrastructure from this experience. They want to live in cities and neighborhoods where children can ride bikes without being subject to the selective attention of motorists more concerned about their own trajectories than the streets they are sharing with others. However, to people not riding bikes, bicyclists can seem like privileged, entitled, arrogant individuals who use their expensive toys to get in the way of legitimate road users. Usually I dismiss this viewpoint as irrelevant prejudice, but I feel concerned when the criticism comes from historically marginalized communities. In a segregated culture, bicycling can seem like yet another way in which people demonstrate their superior social position, calling upon the forces of public funding to build projects that serve only them. From the perspective of communities that historically have been subject to the negative side effects of infrastructure projects, things like bike lanes might fit into larger frameworks of injustice. What do people hear when I say I advocate for bike justice? Bike advocacy's catch 22 is that it involves otherwise socially privileged people who get marginalized as road users. If bike advocates are people who do not have experience with crossing community boundaries and living among people unlike themselves, they may not have the self awareness to recognize who their visions of bike friendly neighborhoods leave out. In The Failures of Integration, legal scholar Sheryll Cashin's 2004 book on the enduring rifts of racial and class segregation in the U.S., she talks about people experiencing integration burn out. From her perspective, "if the group that has most made integration possible--the willing black integration pioneers who boldly pushed their way into white neighborhoods, white schools, and white workplaces--is now less enthused about integration, this has ominous implications for a society on the precipice of majority-minority nationhood." Whose job is integration? As more and more Americans reconsider living in suburban neighborhoods, are they going to make meaningful relationships with new kinds of neighbors? Or are we going to see the same segregated neighborhoods reproduced, but this time with marginalized groups living outside of cities? While I firmly believe that we need to continue to promote a widespread cultural shift that recognizes the social and environmental harms of constant, endless driving, I also think that bike advocates need to recognize our own position within a divided society. I have heard well-meaning bike advocates talk about race and class divides with such clumsiness that it overpowers their bicycling transportation message. If we want to build true coalitions across longstanding cultural divides, it's our job to reach out and learn something about other visions of transportation and public space. Can the Other be a Bicyclist? I listened to the woman, a prominent activist who has fought hard for human rights, as she told me what a bicyclist was. It was a man, probably white, who rode streets with arrogance, entitled, privileged. He knew how to make his machine work for him, shifting gears before riding up hills. He didn't look silly like the person of color huffing and puffing up the steep slope to her neighborhood, she chuckled. I thought about the sounds that would drift into our house on warm summer afternoons, when the horses behind the chainlink fence that separated our neighborhood from the stables had stirred glimmering dust into the breeze. Men's voices, shouting back and forth and laughing as they rode by in what I later learned was called a peloton. They used our neighborhood as a way to pass between the concretized waterways that in Southern California lead to the sea, along what used to be creeks and rivers. They were some of the only white people, besides my mother, the old man Diego, and police officers, who came through our neighborhood, but they did not stop to chat with anybody. It reminded me too of the tricycle that generations of my family had ridden up and down the block where my grandma and great grandma lived, over harsh concrete that liked to stub my toes as I ran barefoot down the street to the beach. One day I was stopped by a laughing man and woman, who offered to oil the tricycle. I had never thought to notice the squeaks it made as I rode along, the only cousin of my age and thus often my own playmate. I felt ashamed and got away from them. To me the tricycle's squeaks were productive; I could turn it upside down and, passing flowers through its pedals and spokes, make ice cream. Returning to the sound of her voice, sitting in the coffee shop in the gentrifying neighborhood, I wondered if I would ever convince anyone that bicyclists can be like me. Maybe I'm still trying to turn flowers into ice cream.